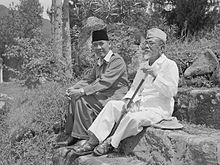 In February 1958, the remaining dissident commanders in Central Sumatra (Colonel Ahmad Hussein) and North Sulawesi (Colonel Ventje Sumual) declared the PRRI-Permesta Movement aimed at overthrowing the Jakarta government. 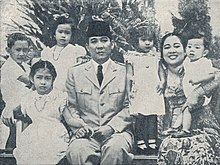 They were joined by many civilian politicians from the Masyumi Party, such as Sjafruddin Prawiranegara who were opposed to growing influence of communists. 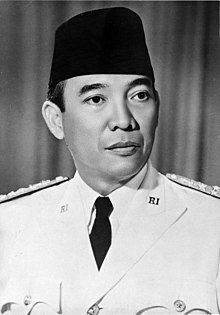 Due to their anti-communist rhetoric, the rebels received money, weapons, and manpower from the CIA in a campaign known as Archipelago. 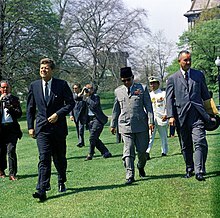 This support ended when Allen Lawrence Pope, an American pilot, was shot down after a bombing raid on government-held Ambon in April 1958. 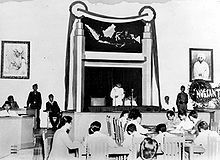 In April 1958, the central government responded by launching airborne and seaborne military invasions on Padang and Manado, the rebel capitals. 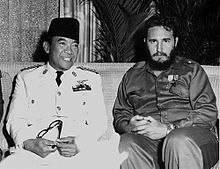 By the end of 1958, the rebels had been militarily defeated, and the last remaining rebel guerrilla bands surrendered in August 1961. 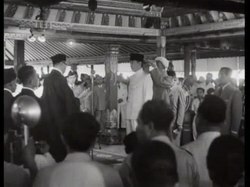 ^ "GANEFO & CONEFO Lembaran Sejarah yang Terlupakan". JakartaGreater. 2015-10-25. Retrieved 2017-05-18.